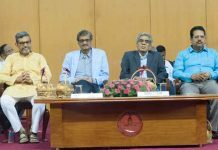 New Delhi: Konark International Cyclothon team led by founder and director Sudhir Dash welcome, felicitated young cyclist Pratibha Dhakane in New Delhi. Pratibha who is her on the way to Kashmir to Kanyakumari on her bi-cycle within 26 days. Konark International Cyclothon team welcome Pratibha Dhakane on her arrival on 27th February. 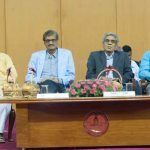 KIC Team members Sudhir Kumar Dash, Dr. Sadanadan Sahoo, Yogendra Singh, Karmendra Singh escorted her till Maneswar for her journey to Kanyakumari. “Recognising her courage and will for her trip from Kashmir to Kanyakumari and felicitated her with the honorary award of “Youth Inspiration Award”. 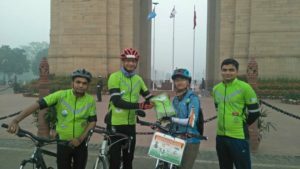 KIC support her voyage to promote Cycling , road safety and women empowerment,” said Sudhir Kumar Dash, KIC Founder. Mr. Dash also salute her effort to Unite India through cycling. It should be noted that Pratibha who hails from Pune, Maharashtra. She has taken up an herculean task of riding solo from Kashmir to Kanyakumari (a distance of over 3200 KM) on her bi-cycle within 26 days. The SSP Police Mr. R.C.Kotwal flagged off her journey on 24that Pathankot. 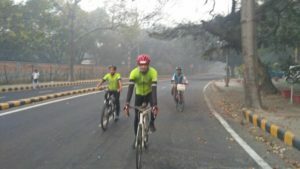 Cyclists from Jammu Cyclists & #ECO_Riders rode with her in camaraderie for 22 KM from where she continued her solo ride. 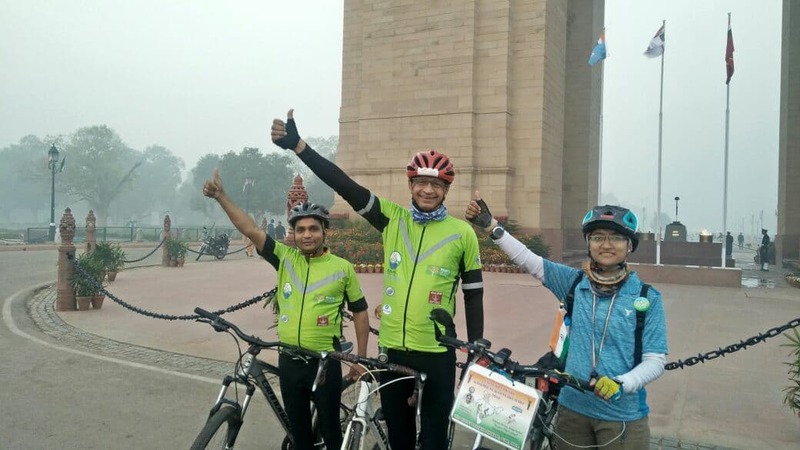 She is riding alone from Pathankot to Kanyakumari on her bicycle to promote Unite India #Khelegi_Bitiya_Jeetega_India #Women_Empowerment, #Safe_Cycling. She is being supported by cyclist enthusiasts across the country & #Blood_Machine_Welfare_Society. Pratibha is from a family of average means. She completed her education from Pimpri, Maharashtra in Arts and started working as a sales girl. Soon due to her diligent work and skills she was hired as chef & presenter by Godrej company to promote the sales of micro-wave Ovens. Having worked for almost 7.5 years she realized that she is destined for something big. She quit her stable well paying job and enrolled for Basic Mountaineering Course with Hialaya Mountaineering Institute, Darjeeling. For last 2.5 years she is working freelance as trekking instructor, guide, coordinator etc. Travelling across the country in this role she realized how we have 2 countries within India. India of rich urban centers and India of poor slum dwellers and villagers. How disadvantaged are our women folk. Add to this her passion of cycling and she hardly can restrain her anger at the unsafe riding conditions and that’s how the mission K2K was born. 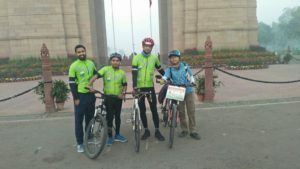 She started her journey on 24th Feb from Pathankot and with night halts at Ludhiana & Kurukshetra has reached Delhi on the evening of 27th Feb. She is staying at Youth Hostel Association of India and is being received by #YHAI, several cycling & adventure enthusiasts and youth and student representatives. She will be seen of by ICC cycling group with a posse of cyclists of ICC riding with her for a short distance in camaraderie on the morning of 28th.